More consumers and businesses are purchasing products online and your business should take advantage of this growing trend. Our internet processing solutions give your customers the ability to purchase your products and services directly from your website. 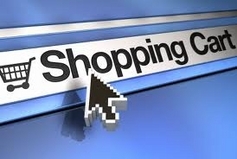 Does your website already have its own shopping cart? Accept payments conveniently using our secure online gateway solution. Create Web Pages in Minutes with the Order Form Generator! This solution is perfect for the merchant who wants to establish an online presence, but finds that the functionality and cost of implementing traditional shopping carts is too much for their needs. The lower cost of the Order Form Generator allows you integrate an eCommerce solution in a cost effective manner. Take advantage of the unlimited income generating opportunities that are available due to the explosion of the internet marketplace. Do you have a website, but no shopping cart? No problem! Use our easy to implement, customizable Shopping Cart solution and create an internet storefront. The integrated Shopping Cart has a simple, intuitive user interface which means that you don't need special programming skills to implement the Shopping Cart. SSL encryptions gives you peace of mind knowing you can process transactions securely. Multiple payment options give your customers added convenience. Begin accepting payments via the internet, on an automated basis, 24 hours a day!